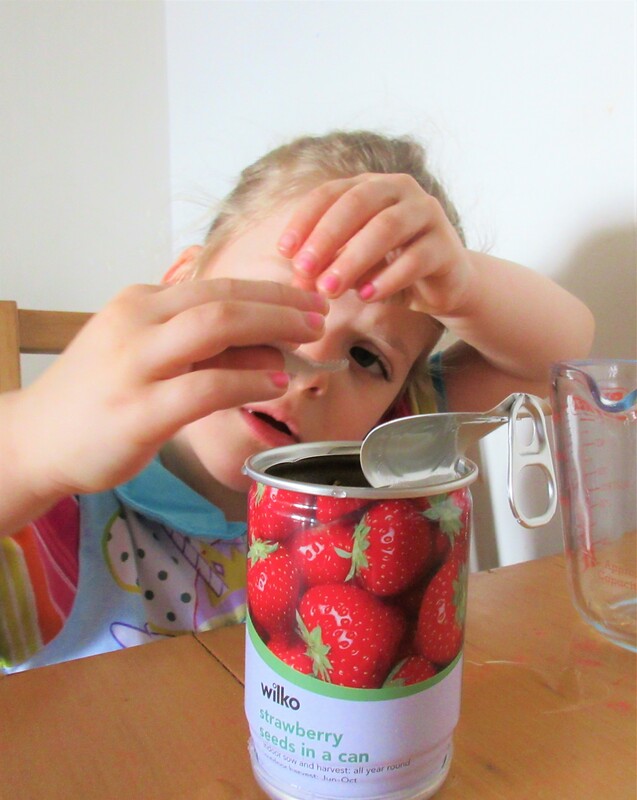 These Indoor strawberry seeds in a can from Wilko are great for just £1! We like to make sure the girls still get to enjoy growing plants even without a garden. They regularly change the plants on their windowsill throughout the year and as it is empty again the Mr picked up the indoor strawberry seeds in a can. Having enjoyed growing peppers last year for their salad, something tasty was needed. 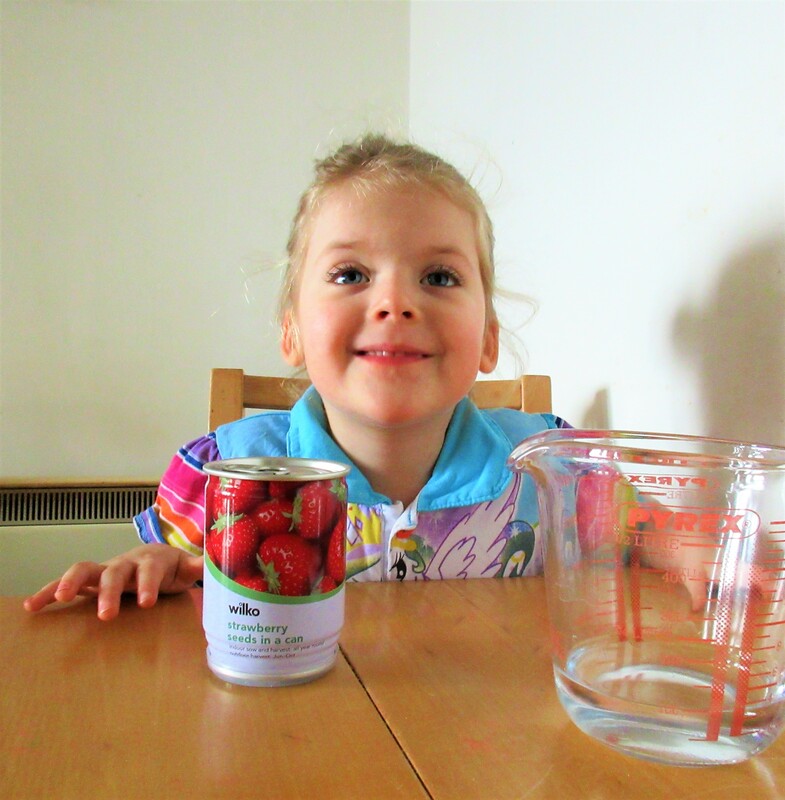 These are so simple even Izzy can plant the indoor strawberry seeds all by herself which she thoroughly enjoyed. You simply remove the plastic cap on the bottom of the can, remove the packet of seeds and open the bottom ring pull. This bottom ring pull opens the drainage system, you then put the cap back on the bottom of the can. Turning the can back the other way, pull the top ring pull and pour in 100ml of water. Izzy found the ring pulls quite easy to open and loved pouring the water in, she loves water! It was nice not having to step in and see her being independent too. Add the seeds, making sure to push them down into the soil in the can and place out of direct sunlight in a warm area between 18-20°c. We popped ours on the bookshelf to start off with as it is away from direct sunlight and fairly warm. Izzy really loved this quick and simple planting activity. 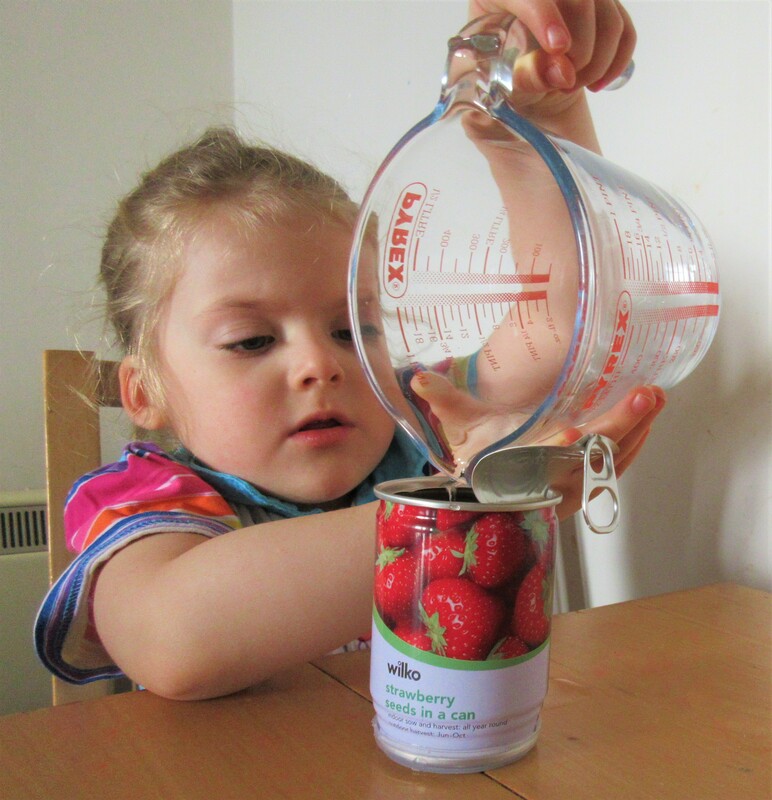 She can’t wait to watch her indoor strawberry seeds grow into a delicious strawberry plant. 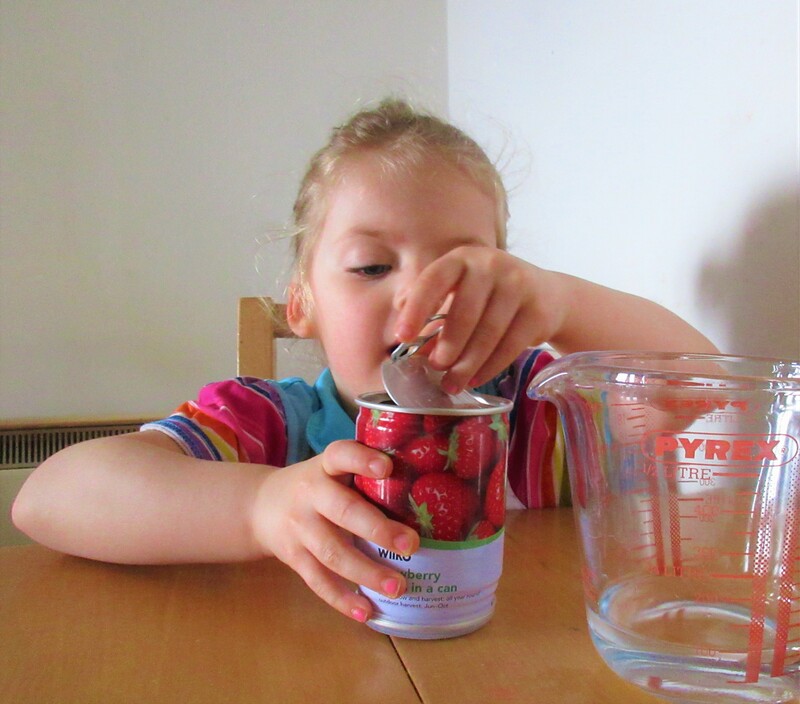 Eva loved growing strawberries when we had a garden and was always the first one out the door each morning to pick the ripe ones! It will be interesting to see what Izzy thinks and the taste difference too! What have you grown lately? Have you seen these indoor seeds in a can in Wilko before? Ugh Christmas bargains.. I love them.. OK.. I admit it.. I’m a liar. I said NO TOYS this Christmas after getting halfway through writing a post on why I’m not buying toys this christmas.. and what did I do? That’s right I acted like a child myself when the Mr spotted this Wilko Wooden Pirate Ship reduced from £15 to £5!!!!! Well now..
On to the next Aisle and I spotted the Wilko Wooden Peg Story kits reduced to 50p each!! So of course I had to grab one of each… Realising I had officially started Christmas shopping! I have to admit although I totally lied to myself about not buying toys this year, I am pretty pleased that for a grand total of £8.50 I am up to 6 presents already! Ah I do love Christmas bargains! I may have talked myself into believing I technically only bought 1 toy as the rest are ‘craft kits’ but I’m hoping we don’t end up buying too many toys. In all honesty though with Wilko amongst other’s reducing things like this and me still being a bit of a child at times, I can see it being a struggle, haha! Have you started Christmas shopping? Have you found any awesome bargains yet? I’d love to hear and see what bargains you’ve found so far! 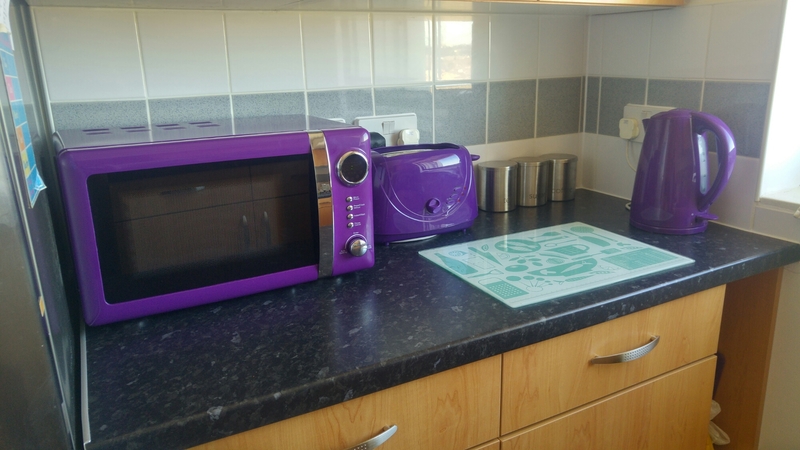 Last week I shared some lovely Purple bits I’ve spotted for my dream purple kitchen & mentioned the Wilko’s Colour Play Purple Microwave which I intended to buy when we got paid for £50 however when the Mr checked they had dropped the price to £40! I love a bargain, it’s cheered me up knowing I not only got my purple microwave but for £10 less! We ordered it on-line Friday morning to be delivered in store within the next 48 hours. The Mr had found that although the price had dropped our local store was out of stock. Luckily there were still 10 left on-line so I quickly ordered it to make sure I got one! Being a bank holiday weekend I didn’t expect a pick & dispatched email until Tuesday morning even though the stores were open on the Monday but by late morning I still hadn’t received an email and after 2 weeks without a microwave already I decided to tweet Wilko and find out when it was due to be picked & dispatched. After DM’ing my order number Connor answered my questions and informed me my order had been lost in transit. IEither I could wait until they had more in stock week or be refunded. I panicked as either way I thought I’d be waiting a week as refunds take 5-7 days. I was already getting stressed without a microwave for so long (I never realised how handy they are until I didn’t have one!) so I asked if there were any in stock in my 2 local stores & Connor quickly let me know he had reserved one at the Basildon store for me! The Mr quickly got in touch with a friend and they went to collect it for me. By 3.30pm I had my brand new shiny purple microwave in front of me! I felt like a kid at Christmas! It was set up on the worktop with the rest of the Wilko ColourPlay appliances we have! Obviously I need a new glass chopping board in purple to compete this worktop 😉 but I think it looks quite now now even on a tight budget & it definitely looks better than the ugly kitchen we had a few months ago! I quite like how small the microwave is as it gives us that little bit more worktop space when cooking. Our last microwave was a huge old beast so it really makes a difference! We tested out the microwave for dinner a few hours later as we had Jacket potatoes. Although I had to show the Mr how to work it. It is pretty simple to set up and use (helps to read the instructions like I had! 😂) and it does what it needs to. I love that it is digital & you can set the time and adjust the settings. There are so many settings! I imagine it will take us a while to use even half of them but for a small budget microwave I am pretty damn impressed!